“The Absinthe ritual is one of charm and elegance, when used and shared with friends, the antiques from France’s La Belle Epoque make the experience more wonderful.” ~ Scott MacDonald, author of "Absinthe Antiques: A collection from La Belle Epoque", best describes the essence and elegance use of Absinthe paraphernalia that is making a come back. Modern replicas of metal 4-tap water fountains have been reintroduced. Preparation involves adding ice and cold water inside the fountain, then water is slowly dripped providing a mesmerizing experience. A second device, the Balancier (see-saw) dripper, a very intricate device is place over an Absinthe glass. when water is poured over the dripper, it divides the water pour into tick tock droplets. providing a slow steady and fascinating pour. And of course the perforated spoons that comes in many shapes and styles that assists in dissolving sugar. Lastly, the Absinthe glass with either a bubble, reservoir shape, or dosage engraving that gives precise measure of Absinthe, directing full attention to the louche. There are many more examples of paraphernalia dedicated to Absinthe ritual. Many Absinthe Antique collectors still buy and use these treasures because it gives the feel of a transforming nostalgia. The Real Green Fairy has finally spread her wings once again and made her way as a go-to drink for many. Not only is Absinthe appreciated at venues, but is also enjoyed at home, outdoors, parties and social gatherings, the same way wine is loved worldwide. 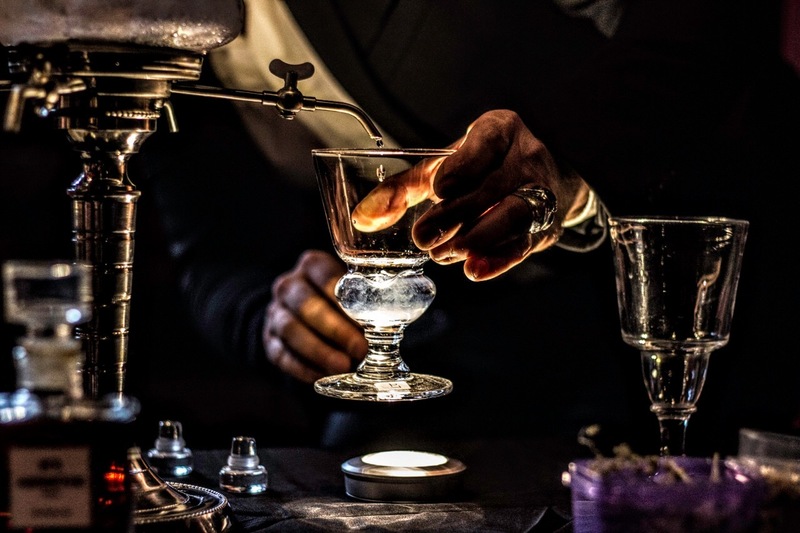 The misconception of Absinthe is gradually being diminished, and the real magic is in the preparation ritual, rather than the misleading perception that has kept her enslaved all these years after the ban.